Searched the online death index yesterday for an entry for Margaret Lamb, buried 14 Dec 1894, but couldn't find her even using the One-Step and searching for "M" "L" "1894." So, I tried the Chicago Death Index (microfilm). I didn't see a match under "Margaret" but then my eye caught a "Maggie" a few lines above and the date was close enough that it struck me it was a match. Knowing that she was there, I decided to scroll through the death certificate film for "L" for December 1894 and it didn't take too many cranks to find her death certificate. The handwriting is dark and thick and the surname could be misread as "Laub" or something similar but I still can't find an entry in the index even WITH the correct certificate number. Rule #1: Even if a name doesn't appear in the online index, don't give up! Rule #2: Don't overlook nicknames . . . 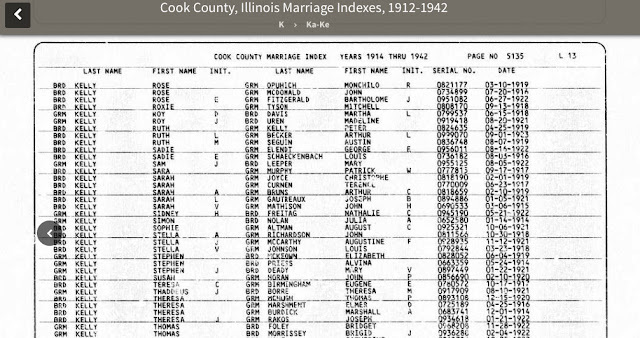 It's been a year and a half since I launched www.chicagogenealogy.com and I've learned a lot about Chicago vital records from all the lookuping I've done since. Just recently, I've begun to think that I should keep track of the odd things I see, the new things that I learn, and maybe blogging would be a good way to do that.